Lights Out tells the story of a brother and sister trying to cope with their manic depressive mother. She talks to thin air and keeps the house in a constant state of darkness for some unknown reason. When Rebecca’s young brother Martin starts seeing the same terrifying entity she once saw as a child things take a sinister turn. Rebecca must then unlock the secret to the terror in order to save her family from the insidious spirit that stalks the shadows. The film stars Teresa Palmer, Gabriel Bateman, Maria Bello and is directed by David F. Sandberg. 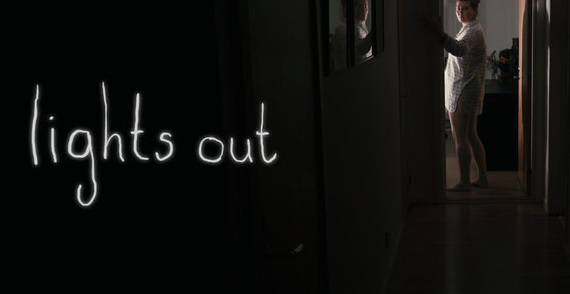 Lights Out is based on the 2014 short film of the same name and same director which had a great tense atmosphere, solid acting and a fairly clever plot even if it was a bit generic. You can only see the ghost when the lights are off and in the dark it can move and kill you but it can’t do anything in the light. It’s simple but very effective and quite scary. The only aspects it was missing was an interesting plot and some well-developed characters. When I heard the short film was being made into a full length feature and the same director was going to be at the helm I was over the moon, I mean what could go wrong? Sadly a lot could and did go wrong. This was one of the least exciting “scary” films I have seen in a long time but before I dissect this carcass of a movie I will give credit where credit is due. The whole mystery behind what the spirit wants, who it was and figuring this out as we went along does keep you interested for the most part. It is built up well and keeps you guessing until the big reveal in the third act which is kind of shocking. Not really that shocking but kind of shocking. Not so much of a gasp worthy moment, more of a grunt of surprise. The other passable aspects of the film were the set-ups for the scares. The use of clever lighting and an all-round decent score made these moments tense and the build-up was great. Unfortunately the pay offs were less than satisfying. I won’t spoil anything but expect quite a few unnecessary jump scares which ruin the atmosphere that was established. Now that I think about it even the good stuff wasn’t really that good. The performances were bland and uninspired. Everybody in the film looked as bored as I was. It was like they all just wanted to collect their pay cheques and go home. The dialogue was mainly just exposition and none of the characters were well developed or developed at all. I really didn’t care about any of them because there wasn’t really anything at stake. Apart from the mystery aspects the scares and plot were generic and predictable. I found myself guessing correctly what was going to happen in pretty much every scene and scary moment which was extremely disappointing. On a technical level this film was a bit of a mess. The way it was shot was pretty basic and the editing was sporadic at the best of times. I'd swear it was edited by Salvador Dali. The setups for the scares were great but the payoffs were terrible. I think that’s an appropriate metaphor for this film. It came off the heels of a fantastic short film but when push came to shove it fell short. Way short. All and all this film is a forgettable mess. The cons outweighed the pros by a lot and its fatal flaw was it being not scary at all. The only scary things about this film were the performances, the generic story line and the terrible design of the main antagonist. I swear they copied the design from the fake ghost in Until Dawn. I would suggest you steer clear of this and save your money for something else. 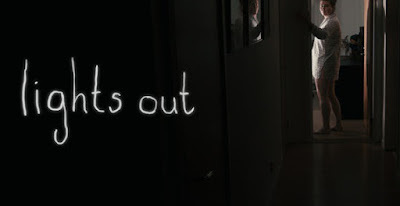 In my opinion Lights Out just barely deserves a 2/10.